In the bowl of a stand mixer, combine water, yeast, salt and sugar. Add in flour and mix with a dough hook attachment until just combined. The dough will be wet and tacky -- this is normal. Divide dough into fourths, placing each piece in a separate bowl. Dye each dough a different color and mix with a spatula or in a clean stand mixer bowl, one at a time, until the dough is fully dyed. Add in more flour 1 tbsp at a time until dough is smooth and elastic. With doughs in their separate bowls, cover with plastic wrap and let rise until doubled, about 2 hours. Preheat oven to 400°F. Set aside two baking sheets lined with parchment paper and sprinkled lightly with flour. Place an empty broiler pan in the oven anywhere it won't eventually interfere with the baking sheets. Once doughs are risen, divide each fourth in half, shape into a ball and place on a lightly floured counter. Cover balls with lightly greased plastic wrap and let rise 20 minutes. Meanwhile, prepare the boiling pot: Fill a large stock pot with water and bring to a boil. Reduce heat to a simmer and add in sugar and baking soda. Poke holes in the middle of each ball with your finger and spread out dough until the hole in the middle is about 2 times larger than the diameter of the bagel wall. Drop bagels in the boiling pot two at a time, careful that they don't touch each other. Let simmer for 2 minutes then, using a slotted spoon, flip over and simmer for another minute. Remove bagels with the spoon and place on baking sheet. Place bagels in oven and pour 1 cup hot tap water in the broiler pan and quickly close oven door. Bake bagels about 20-30 minutes until a deep golden brown. Remove from oven and allow to cool completely before slicing. Drop a few drops of food coloring in light cream cheese and fold into the cream cheese, being careful to just swirl the colors, not mix them. Spread on your colorful bagels and you've got a double rainbow! We all know how boring breakfast can be – day in, day out, it’s the same old thing. 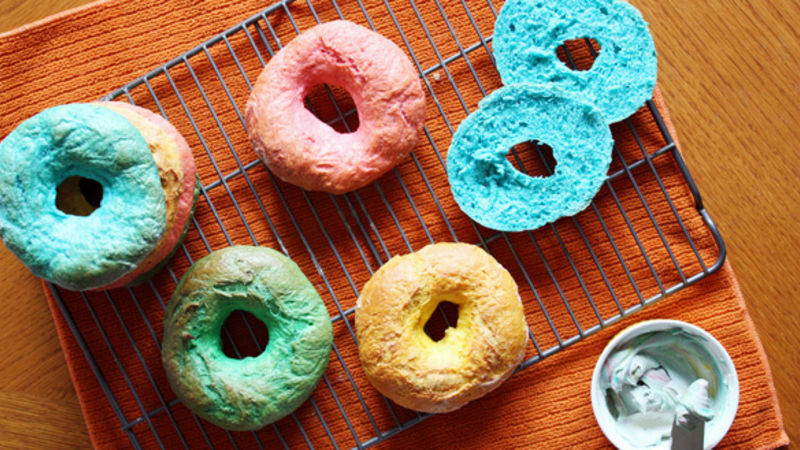 But what if you took your favorite breakfast foods and made them, well, a little more colorful? This recipe sheds a whole new light on one of my all-time favorite breakfasts – bagels and cream cheese. Even bagels can get a little blah, though. These Double Rainbow Bagels are sure to brighten the breakfast table! Though some of this recipe is best left to the grownups (read: boiling pot! ), mixing fun rainbow colors into the dough is a great activity if you have any little hands in your household. They can help you dye the dough pieces all one color, or mix it up and watch the reds and blues turn purple, the yellows and reds turn orange, or the blues and greens turn turquoise! Just be sure to wear gloves when working with the food dye, or you’ll have leftover rainbow all over your hands. And for those without little hands around to help, well, who says you have to be a kid to enjoy this recipe? It’s fun for everyone to see a rainbow served up for breakfast. I’ve said it before and I’ll say it again: Once you’ve made your own, homemade batch of bagels, it’s hard to go back to the store-bought variety. Homemade bagels are soft, with that telltale chewy crust they develop after simmering in the hot water. When served fresh from the oven – with a smearing of rainbow-colored cream cheese, for the double rainbow effect! – they’re absolutely delicious.